On this page we start with a photo of Johnny as an infant and then Johnny takes up the story starting when he was 12 years old and taking us through his early rock and roll bands 'Jeremiah Henry' and 'Sweet Street' until the time he joined Horslips. Here's the photo from the very early days. Johnny, aged two and a half, is the baby in the photo. He's held there in the arms of his father Jim Fean. The lady in white beside Jim is Maureen Fean (nee Murray), Johnny's mum. Johnny was the first born of Jim and Maureen. 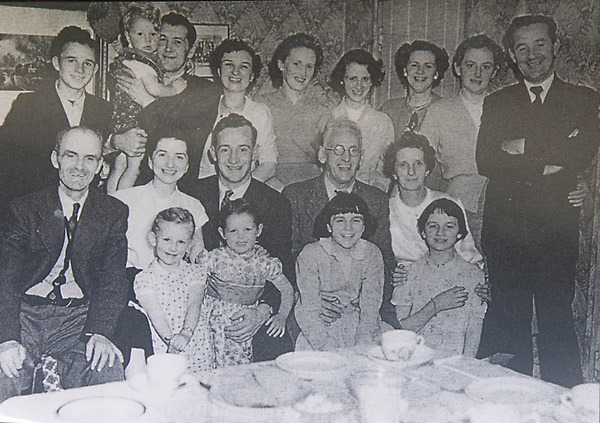 The occasion was a family event for Len Cusack (mid photo in front of Maureen) and Noleen Cusack (nee Murray). The people in the photo are explained in the text below. 2: Noleen Cussack (Nee Murray), sister of Maureen - Johnny's Aunt. 3: Len Cussack, Noleen's Husband, Maureen's brother in-law. 4: Mr Cussack, Len's father. When Guido DiVito unearthed a couple of newspaper clippings of bands 'Jeremiah Henry' and 'Sweet Street' he prompted a few questions about the earlier musical days of Johnny Fean. Below Johnny talks of things he remembers from the years 1963 to 1972. Johnny, "Now that my memory has been a bit unlocked I'm starting to remember the beginning of the musical journey and my school days. I got my first electric guitar and became involved with my first band when I was 12 years old. At that time, 1963, I was attending the Christian Brothers School in Limerick city. After that I spent some time in Ennis at the Technical School before moving on to the Comprehensive School in Shannon, I think it was Ireland's first Comprehensive school and it's still there. Both those newspaper clippings were sent to me by my old friend Guido DiVito. Guido was the drummer and vocals with Jeremiah Henry. As you might guess from the name, Guido's parents were Italian, they owned two fish and chips cafes in Limerick city." Left to right: Johnny Fean (Guitar & Vocals), Joe O'Donnell (Electric Fiddle), Noel Franklin ( Bass), Eamon Walsh (Drums) and Eugene Wallace (Lead Singer). "and the final photo is of Limerick rockers of flower-power '68 Sweet Street, which when viewed gets you wondering and sussing - haven't I seen some of them faces in a more recent state??? Yes, indeed folks. The young gentleman on the left with the popular head cut of the day, the checked jacket and the Paul McCartney jumper is none other than the bould Johnny Fean who now (I'm sure you all know) provides the tasty guitar sounds within the Horslips line up. . . Directly behind Johnny you have another well known figure of International rock, the one and only Joe O'Donnell, East of Eden's master violinist. And on the extreme right the legendary Eugene Wallace. The two other boys are Noel Franklin and Eamon Walsh. . . And that's about it, short and sweet. See you next week, eh?" Johnny, "The Sweet Street photo was taken late 1967 or early 1968 in Limerick. The band was formed by Joe O'Donnell in Limerick, 1967. I was living in Shannon and still going to school, the Comprehensive, at that time. The musical style of the Sweet Street was very much U.S. West Coast along with English Psychedelic music. This music was very much what prevailed in '67. In our set list we played material from Jefferson Airplane, The Byrds, (Eight Miles High), Tim Rose, Tim Hardin, Cream, Hendrix, Stevie Winwood's 'Traffic', (Mr. Fantasy), Steve Marriott and some others I can't remember. We played mostly in Limerick and Cork." Johnny, "The only time we played in Dublin was a gig at the Stella Maris tennis club in the Dublin suburbs. Apparently at a later time Cream performed there, the only time they ever played a gig anywhere Southern Ireland! We played quite regularly in Limerick in those days. Limerick had a thriving beat club and local school dance scene back then. We used to play in the 006 Club, in Cork, which is where Rory Gallagher and Taste were just starting to make waves. The 006 became Rory's stomping ground. Our biggest gig happened in the 006 club when we played support to John Mayall and the Bluesbreakers! It was 1968 and Mick Taylor was the guitarist in the Bluesbreakers by then, having taken over from Peter Green. I was 16 years old, and I can still remember vividly the excitement of watching John Mayall come onstage, and seeing for the first time from only about a foot away, the 'Sunburst' Les Paul Standard that Mick Taylor was cradling as he made his was through the crowd and onto the stage! When he struck the first few notes it was incredible, a truly magical moment, never forgotten! I stood transfixed for the entire performance! Another story that goes with that night is that Mick Taylor asked to borrow Joe O'Donnell's 100 watt amp and stack, two by four 12inch cabinets, and since we were doing support it was already set up onstage. Joe of course obliged but during the Bluesbreakers gig one of Joe's 12inch speakers got blown. Of course gig continued, but Joe wasn't all that pleased! There was no reason to be annoyed though because John Mayall sorted it out at the end of the night. We got word that John Mayall was quite impressed by the band, especially so by Joe's electric violin playing, which as far as we knew at that time had never been used in a rock group. It was pretty unique, well.... apart from one American group called the Flock who had featured electric violin. By co-incidence the next album that John Mayall recorded called 'Bare Wires' featured electric violin, played by Sugarcane Harris, an American. He was a great player and I thought it was a great album! Unfortunately the Sweet Street never managed to record anything. We were together for something under 2 years, maybe only 16 month, disbanding sometime in 1969. Joe O'Donnell moved to Dublin for a short time then went on to join 'East of Eden' in London. Eugene Wallace, lead vocals, was a great singer eventually moved to London and went on to record 2 albums in the early/mid '70s with some very famous UK studio names, and also made an appearance in the movie 'That'll Be The Day' with David Essex." For Johnny, very soon, the next band was to be Jeremiah Henry! Left to right: Jack Costello (Bass & Vocals), Guido DiVito (Drums & Vocals) and Johnny Fean (Guitars & Vocals). Johnny, "The photograph is from about 1970. Both Jack and Guido had been original members of Limerick band 'Granny's Intentions'. 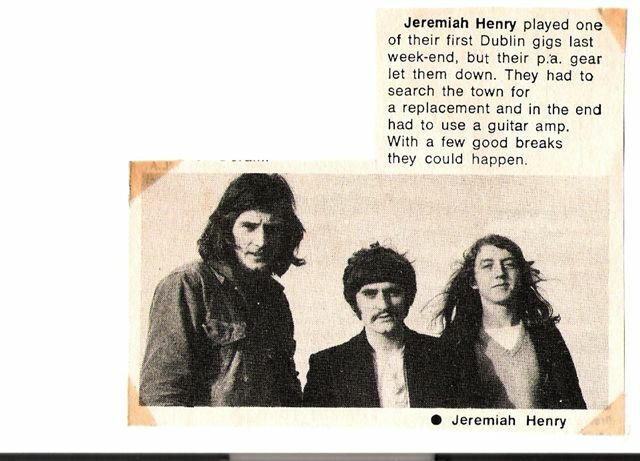 Jeremiah Henry was formed in sometime early 1969 and the band were together until 1971. All of us in the band sang lead and harmony vocals, our set was a mixture country, rock, soul and blues. We played material from 'The Band and Dylan', The Lovin' Spoonful', ' Buffalo Springfield' as well as some country blues and Chicago blues." "Jeremiah Henry played one of their first Dublin gigs last weekend, but their p.a. gear let them down. The had to search the town for a replacement and in the end had the use a guitar amp. With a few good breaks they could happen." Johnny, "Jeremiah Henry rented in a mansion out in Parteen, County Limerick where we lived and also used to rehearse. During my time with the band I lived between the Parteen mansion and my place on O'Connell Avenue in Limerick city. We had other musicians stay at the big Parteen mansion, for instances Phil Lynott, Eric Bell and Brian Downey used to stay in the house in the real early 'Lizzy' days when they'd come to play gigs in Limerick and Cork. Likewise Skid Row used to also drop in and stay. We all traveled to gigs mostly in a big old car with a trailer, a closed metal type, for the gear. This took us to the many gigs we played all around Ireland. Although we recorded a couple of demos we didn't record any material that made it to release. The demos recorded were two of my own songs set down on a 4 track machine in Limerick. One song was called 'Leavin' Today' and the other was 'Got it in my head'! Sadly, the whereabouts of those recordings is unknown! After we disbanded in '71 Guido and Jack pursued different musical careers. What I did was move back home to Shannon for a time, and I started playing at a lot of traditional sessions around Co. Clare. I was playing Tenor Banjo by then and picking up a lot tunes at the sessions. In early September 1972 I got home from being out and was told that a visitor had come looking for me at our home in Shannon. Charles O'Connor had called to invite me to go to Dublin to audition for Horslips. The funny thing is, for some reason, I wasn't initially keen to take up the invitation. Had it not been for my younger brother Donal, who got on to me and nagged me a bit to try it out....well...who knows?" Read some more about Johnny's career at our About the Band page.